Majd and Abdelateef’s family, waiting for the brothers to appear. On Monday 15th October, Palestinian political prisoners Majd and Abdulateef Obeid appeared before a military court for a third time. Their lawyer argued that, as four international activists arrested at the same time with the same evidence had previously been freed, Majd and Abdelateef should be released also. In advance of the hearing, the Obeid family and their lawyer had been optimistic that Abdelateef would be freed, as he has no previous convictions, and there are legal precedents for challenging the detention of Palestinians where international activists on the same charges have been freed. Majd, as he had a previous conviction under similar charges, was expected at worst to receive a light sentence. However, the military judge said that “Majd and Abdelateef are not the same as you” – referring to the two international activists present in the court. It was therefore ruled that Majd and Abdelateef’s detention would continue, pending a further hearing at an unconfirmed date in Ofer military court. The outcome now looks bleaker than previously expected, as it appears that the military court has rejected the argument that Palestinian prisoners should be treated the same as international prisoners. This reflects the apartheid nature of the Israeli system of ‘justice’. Sign a petition demanding freedom for Majd and Abdelateef here. Majd and Abdelateef Obeid’s case was due to be heard in court today, October 11th. 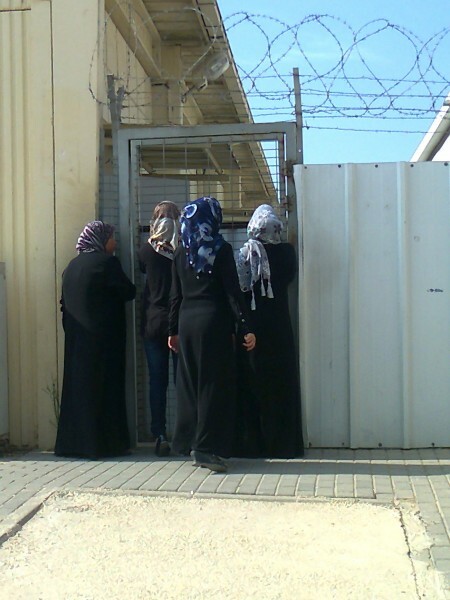 However, Israeli military treatment of Palestinian lawyers at Salem court today led to strike action. Lawyers were protesting about being subjected to full searches when entering the military compound – Israeli lawyers also joined the strike in solidarity with their Palestinian colleagues. Majd and Abdelateef arrived into the courtroom in handcuffs and leg shackles, wearing the same clothes that they were detained in three weeks ago. Their hearing went ahead without a lawyer present and they were informed that their detention would be extended until their next hearing date, which will be Monday 15th October. International activists were initially prevented from entering the court, despite having prior permission. This is a typical tactic of the Israeli army to avoid international observation of the Israeli military justice system. Please sign our petition highlighting the disparity of treatment between the international activists who were arrested and Majd and Abdelateef. The petition signatures will be presented to the judge at Monday’s hearing. In advance of their hearing in military court tomorrow, Majd and Abdelateef Obeid’s mother Sahra Fayez Obeid has recounted to ISM the events of their arrest on the 21st September in the village of Kufr Qaddoum. Neither Majd or Abdelateef attended the demonstration – they were both in their family home, which happens to be on the route of the demonstration. Abdelateef was eating lunch with his family, while Majd was asleep in the bedroom, when three Israeli Occupation Force soldiers attempted to enter the house with force. They pushed Sahra to the ground, forcing their way into the house. There were also a number of soldiers surrounding the property. Ignoring the pleas of the family to leave, they stated “we want the young men, not you”. Finding Majd and Abdelateef, the soldiers grabbed them by the neck and marched them to an army jeep on the road outside. Both men were arrested in shorts, t-shirts and flip-flops. When the family followed the soldiers to the jeep, they were threatened and ordered back to their home at gunpoint. Faruq Obeid, the men’s father was told that if he did not leave, the soldiers would create an excuse to arrest him as well and keep him in jail. 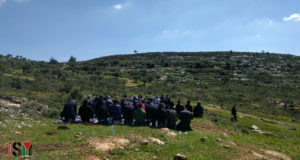 The Obeid family have also been threatened that their home is classed as a Closed Military Zone during the weekly Friday demonstration in Kufr Qaddoum, and that male members of the family are at risk of arrest if they remain at home. Majd and Abdelateef attended a five-minute military court hearing on the 30th of September, at which point their detention was extended and they were charged with endangering the lives of soldiers, throwing stones and with preventing the army from carrying out their military operations. Six soldiers testified against the two men, but the military presented no photographic evidence to back up their claims. They await a second court hearing on the 4th of October, at which point their detention is likely to be extended once more, still without a conviction. Majd, who is 20 years old, is a farmer and sweet-maker – as the olive harvest begins in Kufr Qaddoum, his absence will be felt greatly. Abdelateef is a 23 years old mechanic and was married just one week before his arrest – his new wife Maysam Nasek Obeid will attend the court hearing on 4th October, along with their mother Sahra and other family members. Four international activists who were detained and arrested at the same time as Majd and Abdelateef were released unconditionally on the 30th September, following 48 hours in prison and 7 days under house arrest. They were detained under the exact same charges and “evidence”. A three-tier justice system is applied by Israel in the territories that it occupies – favouring Israeli citizens first, international citizens second, whilst Palestinians face the harshest sentences, contrary to international human rights law and the Geneva Convention. 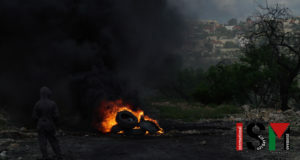 The tactics of the Israeli military seem aimed at quashing resistance to the Israeli occupation in Kufr Qaddoum.